By the late 1920s, support for the German Nationalist Party had intensified as the economic depression and war debts were having a crippling affect on the country. The Nationalist Party led by Adolph Hitler took control of the German nation after winning the election in 1933. Hitler's first priorities were to build up German military forces and create jobs. German workers were forced to leave their unions at that time and join the German Labor Front. To ensure the workers support, anyone registered with the German Labor Front was entitled to one cheap cruise each year. Some of the smaller ships from the Hamburg Amerika, North German Lloyd and Hamburg Sud lines were used for the first of these cruises. Wilhelm Gustloff was the worlds first purpose built cruise ship, designed solely for this service. Her maiden cruise throughout the North Sea began April 2nd 1938. The German invasion of Poland September 1st 1939 sparked off the Second World War. After having been used on cruises in the Mediterranean and Atlantic for just over one year, Wilhelm Gustloff was requisitioned to serve as a hospital ship in the Polish War. The fall of Poland September 27th 1939 saw Wilhelm Gustloff returned to Gotenhafen to serve as an accommodation ship for the military. In the dying days of the war, East Germans were desperately attempting to flee the advancing Soviet forces. 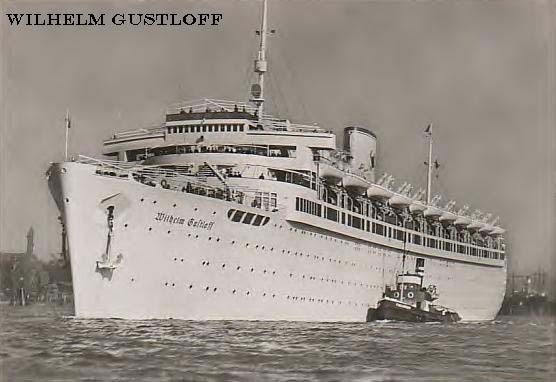 Wilhelm Gustloff left Gotenhafen January 30th 1945 with over 6,000 civilians, servicemen and crew on board. That night, while crossing the Baltic Sea, an attack by the Soviet submarine S-13 succeeded in hitting her with three torpedoes. Wilhelm Gustloff sank within an hour with the loss of over 5,000 lives. This tragedy along with the sinking of the other German liner Cap Arcona three months later, are the greatest ever-maritime disasters.